New driveway walls – replacing an existing overgrown rockery, self-sown ash trees and rhododendrons. Architecture to compliment the house. Garden design is not always about creating something completely different, contemporary, unique or even outlandish, it can simply be to make an area more practical whilst still keeping the already defined areas in the same locations and more importantly keeping the materials and to a certain degree the design in period with the existing property. 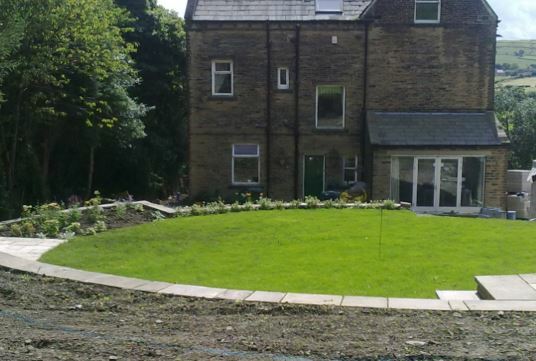 This garden in Bradford (2012) required a complete refresh as it hadn’t been touched since the house was constructed in about 1900. 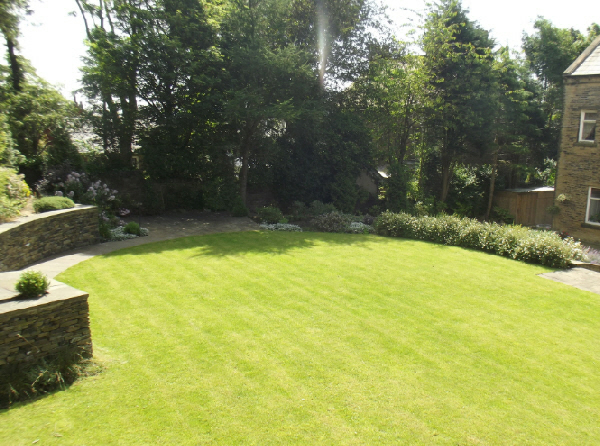 Retaining walls were beyond repair, paths were badly patched or damaged and the lawn sloped too much. There was a typical 1950/60s concrete garage block that had been constructed that had encroached into the garden area and a recent house extension had taken some of the rear terrace. One of the major features designed for the garden are the new steps where a woefully narrow and small flight had previously existed that lead from the new house extension patio doors up to the lawn level. These are wide and imposing steps that are very much in-keeping with the style and period of the house. 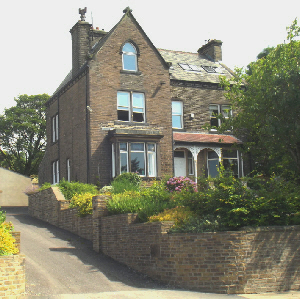 The stone for the steps was salvaged from the existing garden matching the house 100%. 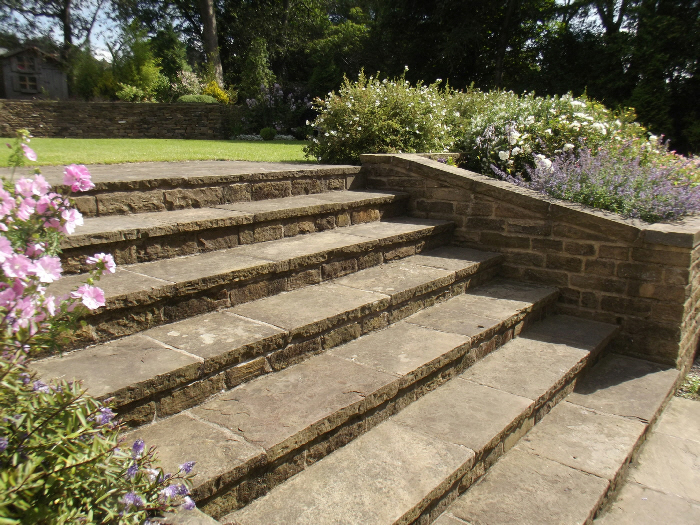 Steps built using salvaged stone from the garden. Photo taken summer 2014 – 2 years after construction. The main steps lead up to the garden level which is designed around a semi-circular lawn which gives the site a much bigger feel. From a practical view it also lends itself to having a seating area in the shade and another in the sun. Planting in any garden is important and in this garden the planting is very much a cottage garden theme. 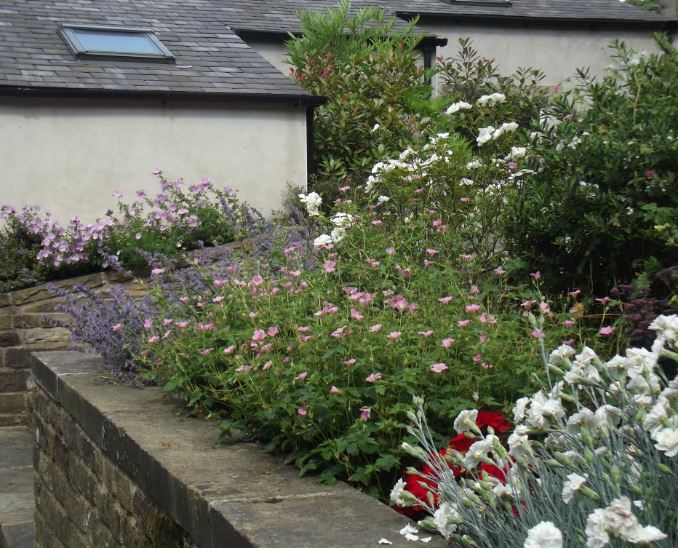 Plants include Nepeta, herbaceous geraniums, white Dianthus, Rosa ‘Kent’ (white) and Alchemilla mollis. Pink Lavatera and yellow daylillies bring bright sparks of colour to the borders to give highlights. New garage complex building to the rear. 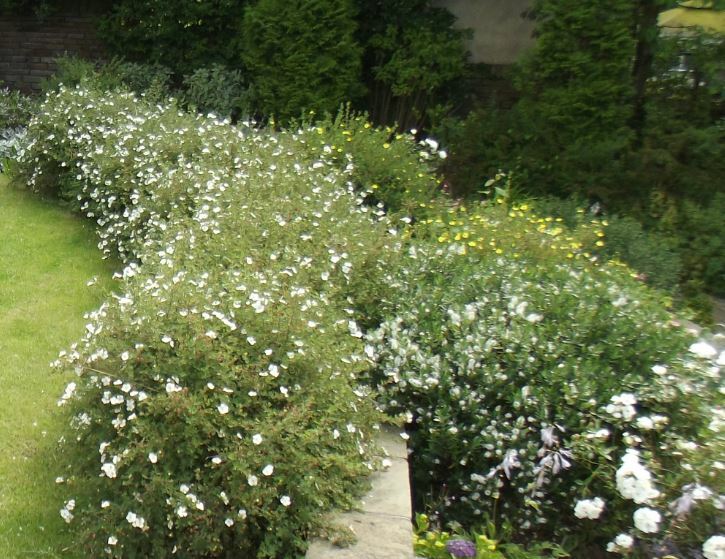 Elsewhere in the garden we were able to plant a low white Potentilla hedge against part of the lawn and also incoporate some larger shrubs and trees – these make a big difference to the overall garden. During construction 2012. Everything has blended in and the planting has matured incredibly well during two years. 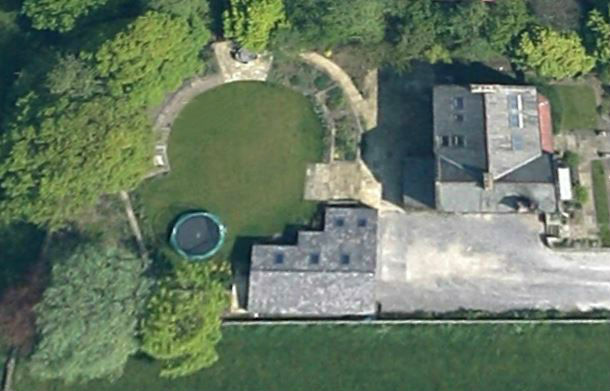 This aerial photograph shows the new garage building (centre bottom). The new driveway was purely an exercise in altering levels and drains in order to make it more practical for cars to turn around in – previously cars had to reverse out onto the main road.